A well-documented, publicly available, global data set of surface ocean carbon dioxide (CO2) parameters has been called for by international groups for nearly two decades. 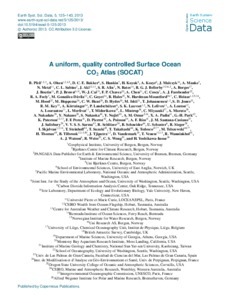 The Surface Ocean CO2 Atlas (SOCAT) project was initiated by the international marine carbon science community in 2007 with the aim of providing a comprehensive, publicly available, regularly updated, global data set of marine surface CO2, which had been subject to quality control (QC). Many additional CO2 data, not yet made public via the Carbon Dioxide Information Analysis Center (CDIAC), were retrieved from data originators, public websites and other data centres. All data were put in a uniform format following a strict protocol. Quality control was carried out according to clearly defined criteria. Regional specialists performed the quality control, using state-of-the-art web-based tools, specially developed for accomplishing this global team effort. SOCAT version 1.5 was made public in September 2011 and holds 6.3 million quality controlled surface CO2 data points from the global oceans and coastal seas, spanning four decades (1968�2007). Three types of data products are available: individual cruise files, a merged complete data set and gridded products. With the rapid expansion of marine CO2 data collection and the importance of quantifying net global oceanic CO2 uptake and its changes, sustained data synthesis and data access are priorities.